Für alle, die auf die Schnelle noch eine weihnachtliche Tischdeko brauchen, habe ich hier kleine Engel auf Tontöpfen. Dazu werden die Figuren mit Heisskleber auf die Tontöpfchen geklebt und evtl. noch ein Stück Tannengirlande um die Füsse gewickelt. 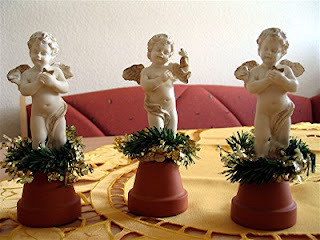 Here is a fast table-decoration: little angels on claypots. All you have to do, is to attach the figures to little claypots, using hot-glue and add some (fir-tree)garland. These table decorations are lovely - what a clever idea! I can see them on a very elegant Christmas table and I'm sure they would cost a fortune to buy in the shops!!!! My (almost) grown up kids LOVE Christmas and expect plenty of festive decor so will definitely be having a go at this - I usually have very little time left for table decoration after all the cooking.